Stan Freberg, a man of myriad talents who was often called “the father of funny advertising,” died Tuesday in Santa Monica. He was 88. Freberg was born in Pasadena and grew up in Los Angeles; he turned down scholarships to Stanford University and the University of Redlands in order to pursue a career in radio. He became a successful comedian and a voice actor in cartoons—his was the voice of the beaver in Disney’s Lady and the Tramp—but it’s as rule-breaking advertising copywriter that I choose to remember him. According to the New York Times obituary, Freberg went into advertising “because he considered most commercials moronic.” In 1957, after the CBS Radio Network canceled “The Stan Freberg Show” after just 15 weeks, Freberg formed his own ad-production company, which he called Freberg Ltd. (but not very). His motto, according to the Los Angeles Times obituary, was Ars gratia pecuniae: “Art for money’s sake.” He “set the standard for humor in advertising,” according to a tribute in Advertising Age: his work included campaigns for Chun King, Jeno’s Pizza, Sunsweet prunes (one of his prune ads starred Ray Bradbury, the science-fiction writer), Contadina tomato paste (“Who puts eight great tomatoes in that little bitty can? You know who. You know who. You know who”), and Encyclopaedia Britannica. Deck the halls with advertising! ’Tis the time for merchandising! Profit never needs a reason! Get the money, it’s the season! Listen to the whole “Green Chri$tma$” recording. A tribute from NPR that includes a sketch Freberg did with Harry Shearer (This Is Spinal Tap, “Le Show”). Judy Protas may have been famous only within the insular world of New York advertising. But some of the ads she wrote, including the 20th-century classic “You Don’t Have to Be Jewish to Love Levy’s Real Jewish Rye,” have been been famous across the country for more than half a century. Ms. Protas, a retired executive at New York agency Doyle Dane Bernbach, died January 7 at 91. Margalit Fox wrote the obituary for the New York Times, which I commend to you. Though its evocative tagline is often credited to William Bernbach, a founder of DDB, or to Phyllis Robinson, the agency’s chief copywriter, period newspaper accounts and contemporary archival sources make clear that the actual writing fell to Ms. Protas, who, working quietly and out of the limelight, set down those dozen durable words. Protas also wrote the lyrics to the Cracker Jack jingle, “which in full (‘lip-smackin’, whip-crackin’, paddy-whackin’, knickin’-knackin’, silver-rackin’, scoundrel-whackin’, cracker-jackin’ Cracker Jack’) has the trochaic rush of a Gilbert and Sullivan patter song,” writes the inimitable Fox. Read more about the Levy’s Rye Bread ad campaign at Barry Popik’s Big Apple blog. Worthington died Sunday at his ranch in Orland (Glenn County), California. He was 92. I’d put him right up there with Ron Popeil of Veg-O-Matic fame (“It slices! It dices!”) and Billy Mays (“That's the power of OxiClean!”). Yes, Cal Worthington was his real name, shortened from Calvin Coolidge Worthington. He honored his namesake, that government-hating public servant, by being a model entrepreneur, a poster boy for bootstrapped individualism. But, as William Grimes notes in his New York Times obituary, Worthington in fact got his first real start in the working world through a government program: FDR’s Civilian Conservation Corps. True, he didn’t have the best relationship with regulators: he was sued twice by the state of California for deceptive advertising. (Both cases were settled without an admission of guilt.) But deception was, after all, his game: he always appeared to love the flim-flammery of advertising more than the actual selling of product. “I never much liked the car business,” he told an interviewer in 2007. In fact, he never owned a car. TV ads today have shorter spans (15 seconds is the norm) and more sophisticated techniques than they did in Cal Worthington’s heyday. But for sheer memorability, you can’t beat those “Go See Cal” ads. Are they the antecedent of “Better Call Saul” on AMC’s “Breaking Bad”? I wouldn’t bet against it. 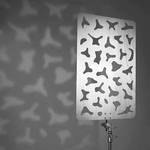 Cucoloris: A screen with oddly shaped holes cut through it, placed before a light source to throw diverse shadows on an otherwise uniform surface. (Source: Idiom Savant: Slang As It Is Slung.) Also spelled cucaloris, kookaloris, kukaloris, cookaloris, cucalorus, etc. Shortened to cookie, kook, or cuke. Alternate names: gobo, ulcer, dapple sheet. Wooden cucoloris, B&H Photo and Video, New York. Popular in the 1930s; back in style again with the movies of Steven Spielberg, who uses a kookalouris with underlighting to show faces that seem to be illuminated by reflections from pots of gold, buckets of diamonds, pools of fire, pirate maps, and radioactive kidneys. It’s fairly well established that cucoloris, however you spell it, comes from the world of Hollywood cinematographers. Beyond that, however, the word’s origins and etymology are frustratingly unclear. In an episode that aired last year, Grant Barrett, co-host of the radio show “A Way with Words,” told listeners that he’d spent “days” researching a Double-Tongued Dictionary entry for cookie. A claimed etymology is that kukaloris is Greek for “breaking of light,” but there seems to be no evidence to support this, nor can the etymological claims in the 2001 cite below* be verified. Another claim is that it is named after its inventor, a Mr. Cucoloris; however, this, too, lacks supporting evidence. * The word “cucaloris” comes from the Greek for shadow play.» —by Ivan Curry Directing & Producing for Television Nov. 29, 2001. The word cukoloris is Gaelic and means “ghost charm.” How a Gaelic word became a standard term in film production is unknown. A note about Roger Ebert: I never met or corresponded with him, but I was among his many admiring readers and Twitter followers—even when I was muttering “WTF?” about his conclusions. In 2010, I attended a program at the San Francisco International Film Festival at which he received an award; cancer had already taken away his ability to talk, but his impish wit and pointed opinions suffered not a bit from the intervention of a speech synthesizer. After answering questions from the stage of the Castro Theater, he introduced Julia, which starred Tilda Swinton – “Saint Tilda,” Ebert called her – and which Ebert assured us was a great, great film we were privileged to see. (Released in 2009, it had been largely ignored by theaters.) Now, I grant that Swinton is never less than fully committed to a role, but Julia was godawful: violent, amoral, ugly, pointless, and, at 144 minutes, seemingly interminable. About a third of the audience left before it was over. I stuck it out, but – to borrow a phrase Ebert himself made famous – I hated, hated, hated this movie. And yet I loved Ebert for championing it, and for being not just a critic but also an exuberant fan. I will miss him a lot. Many of us who work in branding are mourning the death of Michael Cronan on January 1. Cronan, who lived and worked in Berkeley, was an artist, graphic designer, product developer, brand strategist, and teacher. With his wife and creative partner, Karin Hibma, he also created names for many companies and products, most notably TiVo and Kindle. He had been diagnosed with cancer five years ago. I met Michael Cronan a couple of times over the years and was impressed by the breadth of his skills – he truly merited that overused term “Renaissance man” – and his generous, thoughtful manner. I wrote in 2008 about how Cronan named Kindle. The creation of TiVo is ancient history in the advertising racket, Cronan said, but the story bears repeating. Cronan and Hibma held a half dozen meetings in Silicon Valley with the manufacturer, hashing out possible names for the device. At the time, a competitor was marketing a similar gizmo, called Replay, and Cronan needed something better. TiVo, Cronan knew, was the right thing to call the device, even though its manufacturer was more impressed with some other choices that Cronan was kicking around: Lasso and Bongo. Lasso was a contender, Cronan said, because the device lassos TV programs the way a cowboy lassos cattle. And Bongo was a possibility because the gizmo had two round things on top, like bongo drums. But both of those names, Cronan felt, were lousy. In all, Cronan recalled, the designers were considering no fewer than 800 names for the product. None said television as well as TiVo did, Cronan argued. And with its capitalized V in the middle, it sounded revolutionary as all get-out. After Cronan, also an award-winning graphic designer, came up with the logo for the product - that smiling, walking television with the rabbit ears - Replay never knew what hit it. For more about Cronan and Hibma’s approach to the naming process, read this Q&A on the Wordnik blog, published just over a month ago. Michael Cronan’s life and work were an inspiration to all of us who build brands. His death is a huge loss. Crowdsourcing a name for a new apple-flavored Mountain Dew beverage seemed like such a good idea. What could possibly go wrong? Oh, plenty. “Suddenly, its gallery of suggestions featured such winners as ‘Gushing Granny,’ ‘Diabeetus,’ and my personal favorite, ‘Fapple’.” Mountain Dew now says the campaign was created by a local customer, not the company; the “offensive content”—created by unknown pranksters—has been scrubbed from the “Dub the Dew” website. Speaking of idioms: Absolutely nobody knows where the phrase “round robin” comes from. The most-loathed words in the English language, according to readers of The Atlantic, include moist (of course! ), curate, slacks, and artisanal. Love logos? Love data? Check out Emblemetric, a new blog by James I. Bowie about trends in logo design. No seat-of-the-pants stuff, this: Bowie bases his reports on more than 1.2 million logos in the U.S. Patent and Trademark Office database. Sample finding: “The use of two stars as a design element in US logos increased by 170 percent in 2011 over the preceding five-year period. Looking back over time, we can see that, following a pronounced dip in the 1970s, logos with two stars have been claiming an increasing share of new trademark filings for the last three decades.” Be still, my geekish heart. At Union Square Café, a “K1” is a diner who will be proposing to his date. At Michael’s New York, “Lawn” is a chopped salad chopped extra fine. Ben Schott deciphers these and other secret codes used in the dining rooms and kitchens of some well-known New York City restaurants, . Eleven wonderful words with no precise equivalent in English. Quite a few are new to me, including bilita mpash (Bantu for “the opposite of a nightmare”) and ya-arburnee (Arabic for “may you bury me,” i.e., the expressed hope that you die before your beloved does). (Hat tip: @ourboldhero). What’s the nerdiest preposition of them all? Nope, not “notwithstanding.” Not even close. I personally don’t feel that the world is going to the dogs or that young people are inferior to their counterparts of a previous generation. Our moral codes have changed slightly, but what we have now is a lot better than the days of stricter moral codes when there was child labor, no equality for women, no federal aid for destitute people, plenty of robber barons and lynching. I didn’t know Nora Ephron, but that isn’t stopping me from taking her death—yesterday, of leukemia—very personally. Just a couple of weeks ago, after all, she’d been in my car, talking about her career at the New York Post, her incipient bald spot (she called it “my Aruba,” and you really have to hear her explain why), and that travesty known as the egg-white omelet. She sounded feisty and funny and thoroughly, you know, alive. OK, she wasn’t physically in my car. But her voice was there, reading her most recent collection of essays, I Remember Nothing: And Other Reflections, an audiobook I’d checked out from the library. I listened to all three discs, and then I listened to them again. And I remembered, again, how much Nora Ephron has meant to me. Most of the tributes to Ephron have focused on her hugely successful movies. I’m sorry to say—which is, by the way, a phrase I associate with Ephron, as is “by the way”—that I remain a grumpy skeptic. Sleepless in Seattle, You’ve Got Mail, and When Harry Met Sally are too slick and schmaltzy for my taste, with heavy-handed soundtrack cues telling you exactly what to think and when to weep. It was her journalism and essays that made me an Ephron fan, beginning with pieces in Esquire like “A Few Words About Breasts” (whose slam-bam ending was shamelessly swiped by Lionel Shriver in her novel So Much for That) and continuing through her sharp-eyed, hilarious work for The New Yorker and Huffington Post, some of which was collected in I Feel Bad About My Neck (2006) and I Remember Nothing (2011). Here was a woman who could be smart and funny on deadline. I loved her ear for the rhythm of a sentence and her eye for everyday nuttiness and sadness. I wanted to learn from her. I wanted to imitate her. I wanted to be her. Except, probably, for the miserable marriage to that two-timing bum Carl Bernstein. Which, of course, she turned into a best-selling novel and hit movie, both called Heartburn. Take that, Watergate Boy. Salander opened the door a crack and spent several paragraphs trying to decide whether to let Blomkvist in. Many italic thoughts flew through her mind. Go away. Perhaps. So what.Etc. But it wasn’t all wit on wry for Ephron. Read or listen to “Pentimento,” her essay about Lillian Hellman, in I Remember Nothing, to see how Ephron could illuminate the contradictions of a legendary personality and eulogize the painful end of a long friendship. Then there’s NPR’s tribute, which combines a report by Neda Ulaby (whose name would no doubt have tickled Nora Ephron no end) with an intro and outro by “Morning Edition” anchor Renee Montagne. In the outro, at about 3:23, Montagne flubs the title of Ephron’s final essay collection, calling it I Can’t Remember Anything. I wish Nora Ephron were here. She’d have the perfect comeback. More on Ephron: Noreen Malone at New York magazine and Emily Yoffe atSlate (both via Nancy Nall). I was saddened to read of the death this week of Russell Hoban, the author of two of the most memorable, startlingly original works of fiction I’ve ever read: Riddley Walker and The Mouse and His Child. Hoban was born in Philadelphia but lived for the last four decades in London; his later fiction was strongly influenced by English history and culture. (In the Acknowledgments to Riddley Walker he credits the novel’s genesis to his first visit to Canterbury Cathedral, on March 14, 1974. He began work on the novel exactly two months later; it took him five and a half years to complete.) As a young man Hoban worked as an advertising copywriter and illustrator, and the skills required for those jobs—word play, storytelling, visual acuity—surely helped shape his unique writing style. On my naming day when I come 12 I gone front spear and kilt a wyld boar he parbly ben the last wyld pig on the Bundel Downs any how there hadnt ben none for a long time befor him nor I aint looking to see none agen. According to the Times obituary, Hoban’s final novel, Soonchild, will be published early next year. In 2006, the Milwaukee Journal-Sentinel’s Jim Higgins wrote an appreciation of Riddley Walker. He includes it in his obituary of Hoban, published in his “Recommended Reading” blog. P.S. Yes, I know that Hoban is better known in some quarters as the author of the Frances books for young children. I haven’t read those books, but this lovely appreciation of them by Lawrence Downes makes me want to.